It’s not every day you’re welcomed aboard your Carnival Cruise by none other than Kathie Lee Gifford. 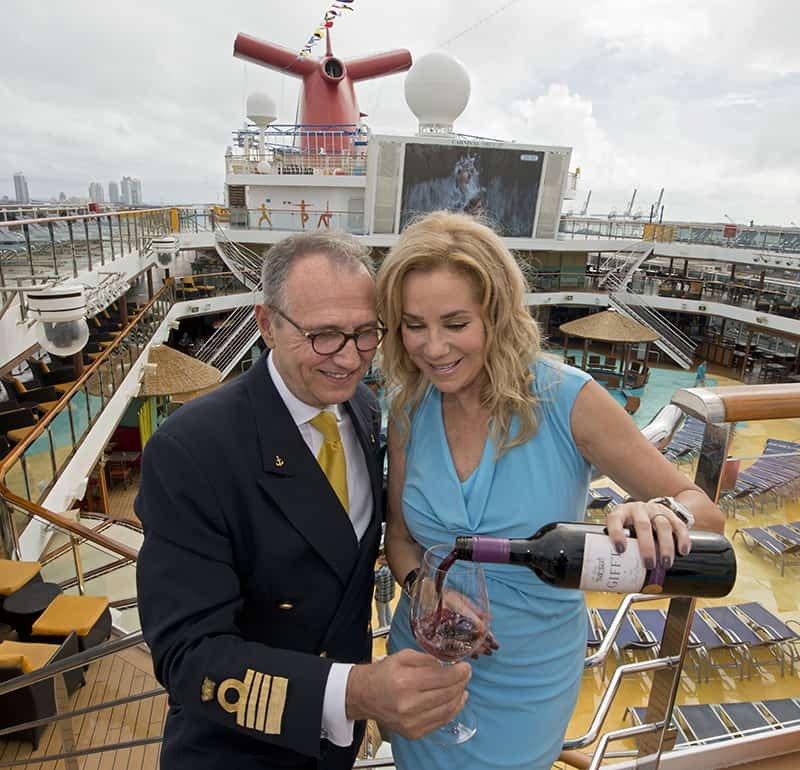 The former spokesperson for Carnival Cruise Line, returned to “The World’s Most Popular Cruise Line®” Sunday to introduce her GIFFT Collection of wines at a tasting event for cruise guests on Carnival Breeze at PortMiami. The wines are now available for sale fleetwide on Carnival’s 24 ships. Gifford became closely associated with the Fun Ship brand in the 1980s when Carnival launched the first national television ad campaigns in the cruise industry, becoming the line’s first spokesperson and appearing in such memorable campaigns as: “If You Could See Me Now” and “Ain’t We Got Fun?” The “Today” show host yesterday surprised guests embarking on a six-day western Caribbean cruise to officially introduce GIFFT wines at an onboard tasting event. “I can’t tell you how exciting it is for me to be back on board with Carnival!” said Gifford. Created in consultation with California-based Scheid Family Wines—one of the largest vineyard owners in Monterey County—the GIFFT Collection consists of a Red Blend and a Chardonnay, both estate-grown. In September 2014, Wine Enthusiast magazine gave the red 91 of a possible 100 points and the Chardonnay 88 points in its tasting rating. The GIFFT Red Blend combines Merlot (42 percent), Petite Sirah (25%), Syrah (12%) and Petit Verdot (10%); while the Chardonnay is a flavorful estate-grown Coastal California dry white. Carnival is the only cruise line to feature GIFFT wines, and both varietals are now available at a wide array of bars and in the main dining rooms on all Carnival ships.